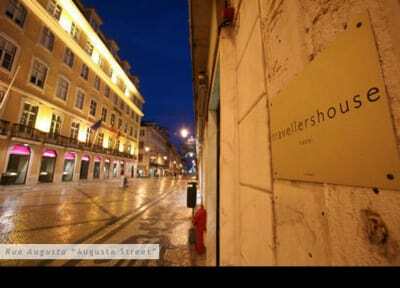 The Travellers House is ideally located in the most historical and central area of Lisbon (Baixa), within walking distance to all major attractions and interesting spots of the city, with a superb transport network at your door. 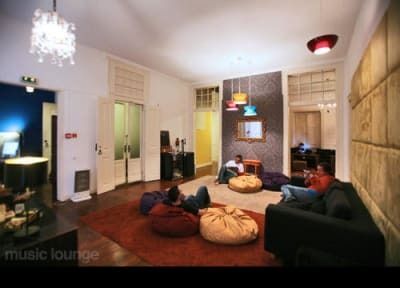 In our 250-year-old building, we invite our fellow travellers to relax in our music lounge, enjoy a film in the TV/DVD room or read our books and surf our mega-fast internet, in the reading lounge. We appreciate the importance of clean facilities; therefore, we'll be cleaning all day long, making sure everything is spotless. Our facilities include bathrooms for men and for women, hot showers 24 hours a day, four common rooms (dining room, Music lounge, TV/DVD area, reading lounge), and free use of the kitchen. Our features include free individual lockers and locks, free towels, linen and duvets, free coffee and tea all day, free breakfast, free Wi-Fi and free satellite TV and films. To help you get around, we've got a book exchange, free maps and advice and free access to guide books from all around the world. There's also free luggage storage. I am so happy I stayed at this hostel. The staff was so nice and accommodating when I wanted to store my bike overnight. They answered my questions by email in no time. 3 choices of breakfasts. There are lockers in the rooms and small padlocks are provided. And it's so clean and central. The only annoyance is the fact that the hostel is located on Rua Augusta, a very busy street, so there is some noise until midnight. Bring ear plugs! I recommend for sure. Such a great hostel! Joao gave us some great recommendations (which led to some of the best food I've ever eaten), and was so helpful with all our questions. Everything was clean, the beds were comfortable and the breakfast was great. Definitely will stay here again next time I'm in Lisbon! Very nice staff! stayed at the ensuite double room, basic but clean. they have activity every night, ie. fado and street art, but we couldnt join. we did the laundry and they helped to return it nice and neat in our room! Also, the location is perfect! you have everything at the doorstep! This hostel is probably one of the best places that I have stayed in all over Europe, the staff are AMAZING and NICE. The location is great less than 5 mins from the centre and the main train station that can take you to Sintra. The rooms are spacious and clean and the lockers are good with a towel and a lock. The location couldn't be better and the staff is always available for help and indication. The hostel is also a very nice place with common places and good rooms. Perfect! Great location, clean facilities, awesome staff, good breakfast. Cool music and atmosphere. One of the best hostels we've stayed in, certainly as regards to location, friendly, helpful staff and great atmosphere. The evening events are great fun and special thanks to Joao and Luis for making them so enjoyable. Would certainly recommend. Great staff, very clean space, perfect location and delicious breakfast. We really enjoyed our stay here- the only things that could be improved are the communal spaces (not much room to lounge or do work) and the social events they do (aka they should organise more events outside of the hostel). But overall, great experience! Everything was great except the bed. It was low to the ground on wooden slats which meant every time you moved only slightly, it made a loud noise and was quite uncomfortable. Great location, great service, nice traditional atmosphere. There was a smell coming from the mens restrooms in my hall that I could smell down the hall though. Otherwise, great place.